LeBron James pulled off the unthinkable, leading the Cleveland Cavaliers to an NBA championship after trailing 3-1 in the series. James was also named NBA Finals MVP, raising the number of trophies he has won in his career to 13, tying him with Magic Johnson, and trailing only Michael Jordan (22), Bill Russell (17), and Kareem Abdul-Jabbar (15). 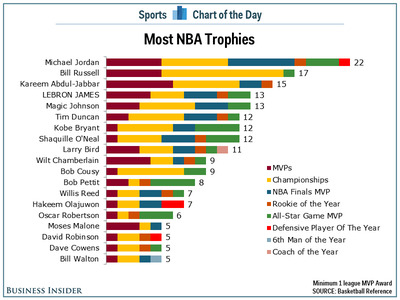 Of course, recent players have an advantage when it comes to trophies. The Defensive Player of the Year award has only been around since 1982-83 and the NBA didn’t start naming Finals MVPs until 1968-69. Bill Russell won his final championship during the 1968-69 season, and it is safe to say he would probably have at least ten more trophies if both of those awards were available in his day. Of course, there were also only eight teams in the NBA when Russell won his first title, so there was less of a challenge to win championships. Still, James is now in some pretty elite company, and at 31 years old, he probably still has a few peak seasons left in the tank.